Cool breezes and open skies have a charm of its own, as does a beautifully decorated indoor space. What if we say that you can get both for your events? Yes, we bring you Four Points By Sheraton, Vashi, Mumbai, a 5-Star property that is a captivating venue in Mumbai. The mesmerising interiors of Four Points by Sheraton will instantly make you want to book it immediately for your wedding. This banquet hall in Vashi has a contemporary architecture and allows a mandap setup right beside the pool. Isn’t it the perfect way to host a small to a big fat Indian wedding in a chic and stylish way. The three different banquet spaces are perfect to host pre-wedding functions, like mehndi and sangeet, while a combination of these party areas offers a wider space for bigger celebrations. The lush green view and exotic surrounding that this wedding venue has to offer will uplift your wedding celebration a notch higher. 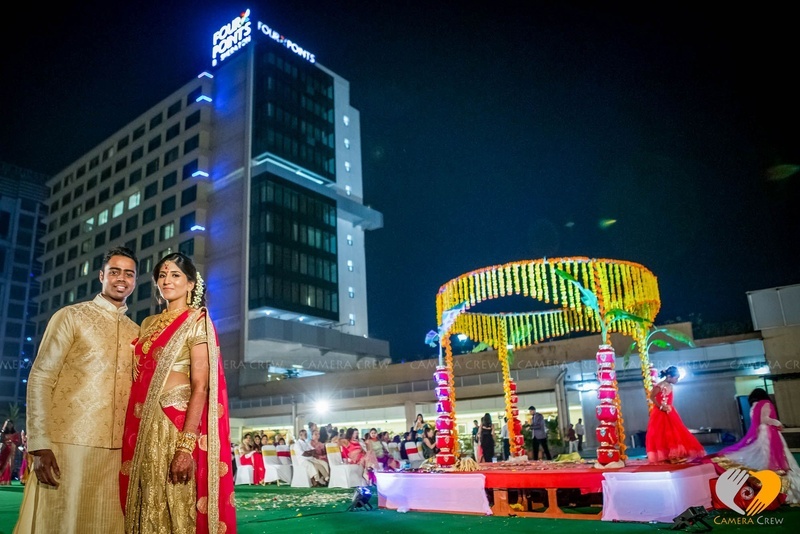 Four Points by Sheraton have their internal wedding specialist team who look after all your wedding related services, right from decorating the venue to match the fanfare of your wedding festivities, serving delicious multi-cuisines to foot-tapping music and entertainment facilities. Alcohol too is served in-house, making it suitable for fun cocktail parties.